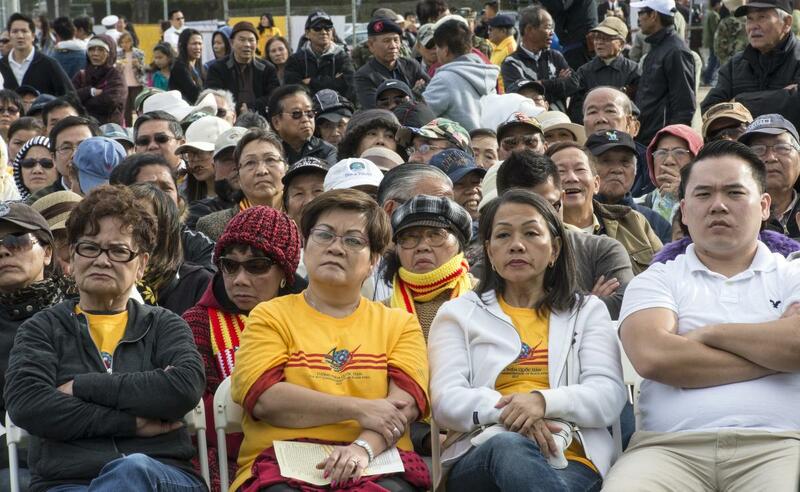 GARDEN GROVE – National pride, tears for fallen soldiers and a continued defiance of Vietnam’s communist government marked a commemoration of the 40th anniversary of the fall of Saigon on Saturday afternoon. South Vietnamese Marine veteran association member Phuong Nguyen, center, and other members hold onto the South Vietnam Flag before the presentation ceremony during The 40th Commemoration of Black April event at Bolsa Grande High School Stadium in Garden Grove on Saturday. Commemoration event for the 40th anniversary of the fall of Saigon at Bolsa Grande High School. This is the one that was originally set for Camp Pendleton, but was moved last minute because a U.S. policy prohibits the use of flags and other symbols of unrecognized countries. … The event runs from 3 to 9 p.m. and there will be a candlelight vigil. 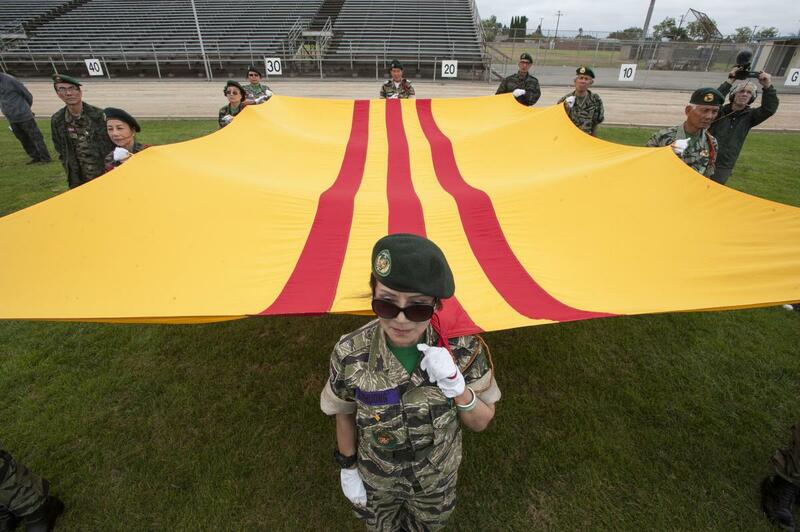 The ceremony, originally planned for Camp Pendleton but moved to Bolsa Grande High School’s football stadium, was one of several set for this month, to be culminated Thursday evening – the anniversary of Saigon’s fall. About 2,000 people attended the Bolsa ceremony, far fewer than were expected to attend the one planned for Camp Pendleton. 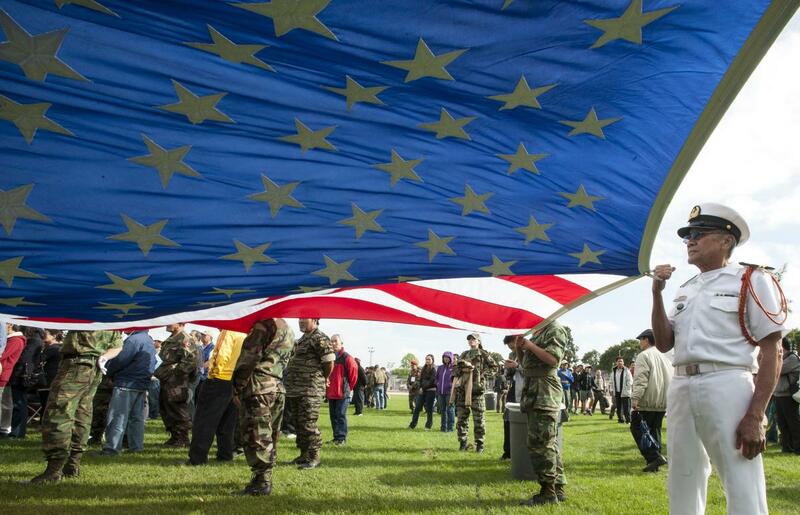 The Marines base remembrance was billed as a return to Camp Pendleton, complete with a re-creation of the tent city where 50,000 Vietnamese refugees temporarily lived after arriving in the United States in 1975. 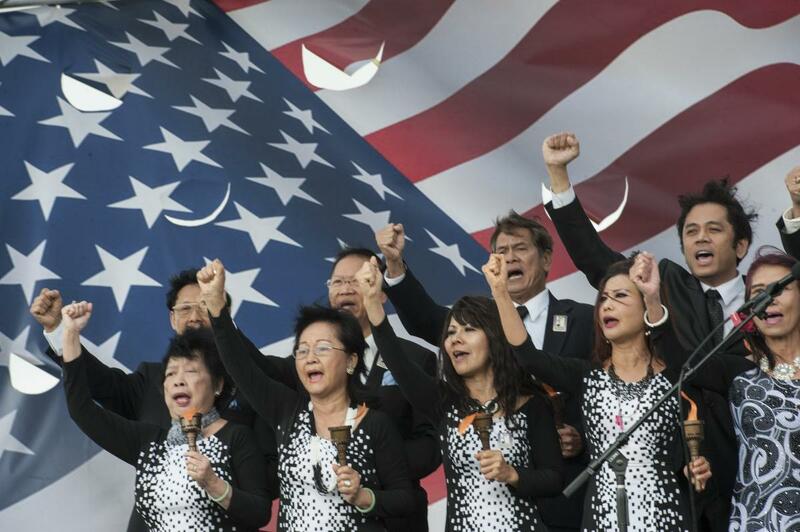 Organizers scrapped Pendleton as the ceremony’s location after learning they couldn’t use the South Vietnamese flag or play its national anthem because of a U.S. policy prohibiting the use of symbols of unrecognized countries in federal facilities. That sparked a scramble by organizers to find a new location. In 10 days, organizers raised $25,000 and set up the commemoration at Bolsa Grande High. The remembrance included a speech by Talbot Henry Bashall, who directed the Refugee Control Center in Hong Kong in 1979 and 1980, a time when thousands of boat people escaped Vietnam; performances by marching bands from Bolsa Grande and La Quinta high schools; a photo exhibit of life at Camp Pendleton; and the South Vietnamese national anthem. The South Vietnamese flag flew high alongside the American flag. South Vietnamese Navy veteran Hung Nguyen, of Long Beach,holds onto the American Flag before the presentation ceremony during The 40th Commemoration of Black April event at Bolsa Grande High School Stadium in Garden Grove on Saturday. 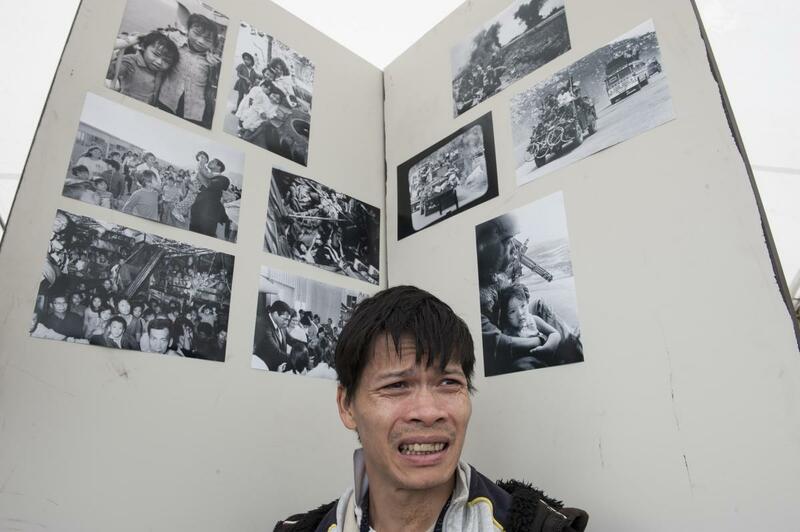 John Nguyen gazes outward by a display of Vietnam photographs, during The 40th Commemoration of Black April event at Bolsa Grande High School Stadium in Garden Grove on Saturday. 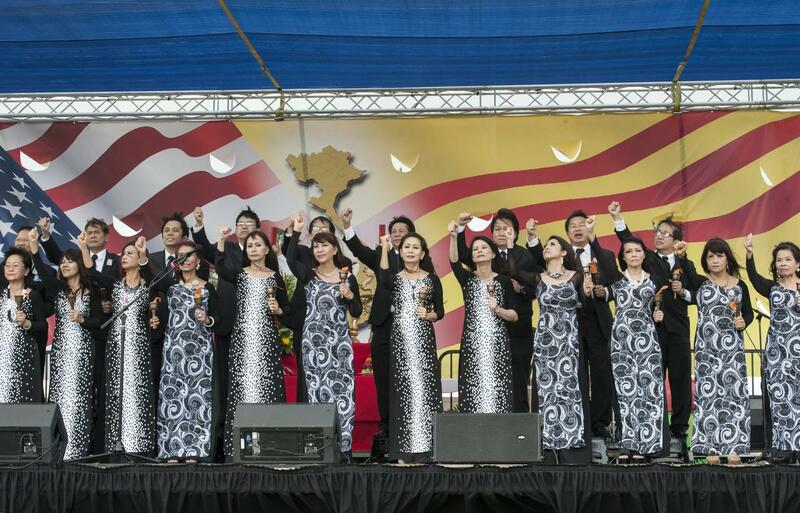 CLBTNS members perform for the audience during The 40th Commemoration of Black April event at Bolsa Grande High School Stadium in Garden Grove on Saturday. 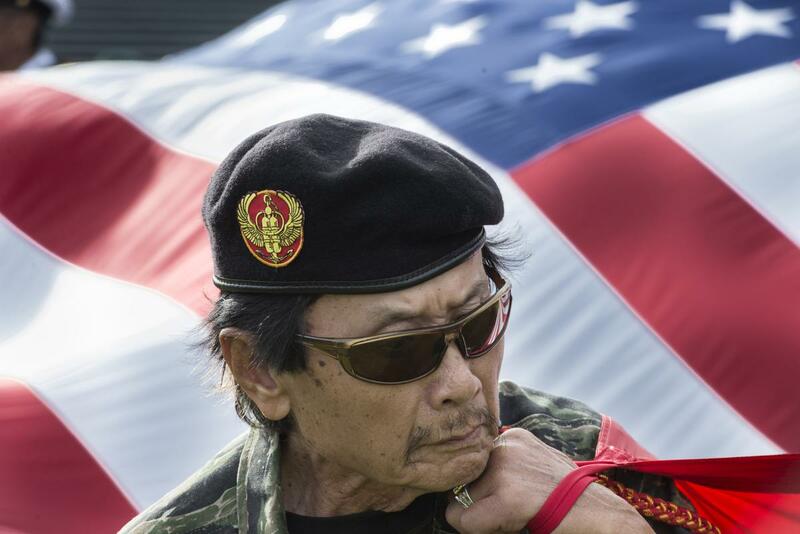 A South Vietnamese Armed Forces veteran holds the American Flag during the presentation ceremony during The 40th Commemoration of Black April event at Bolsa Grande High School Stadium in Garden Grove on Saturday. 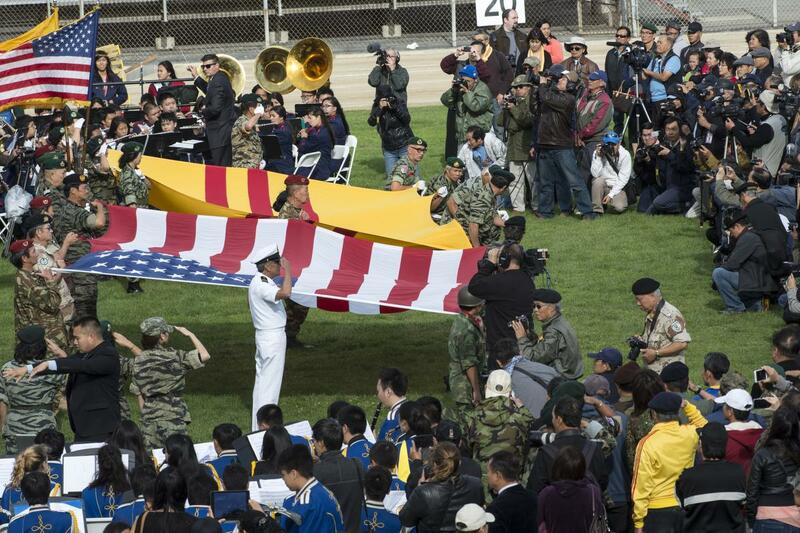 South Vietnamese Armed Forces veterans present the American Flag and the South Vietnam Flag during the presentation ceremony during The 40th Commemoration of Black April event at Bolsa Grande High School Stadium in Garden Grove on Saturday. 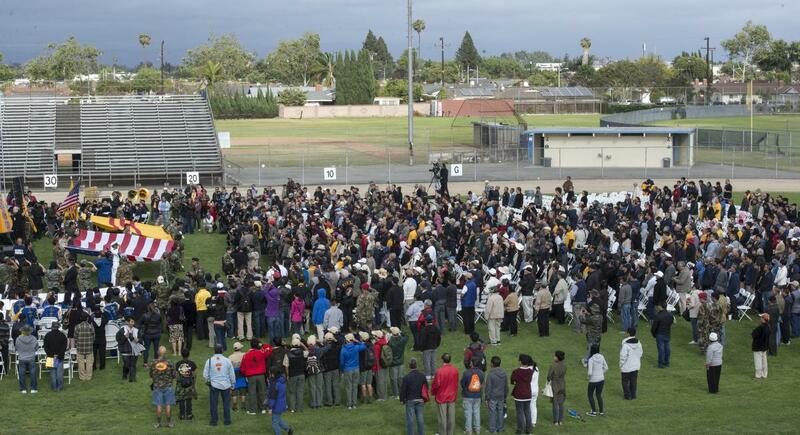 Crowds of people gather as they listen to guest speakers during The 40th Commemoration of Black April event at Bolsa Grande High School Stadium in Garden Grove on Saturday. 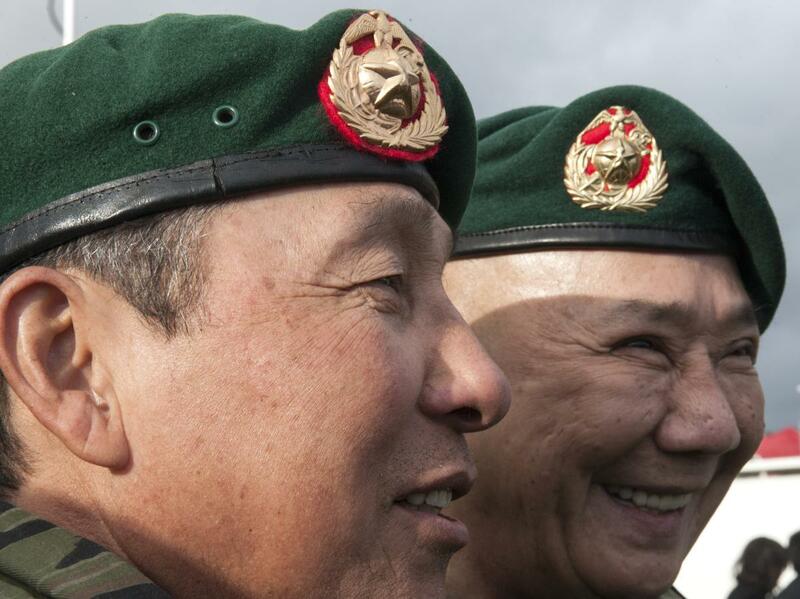 South Vietnamese Marine veterans John Tran, left, and Benjamin Ly, both of Garden Grove, share a laugh during The 40th Commemoration of Black April event at Bolsa Grande High School Stadium in Garden Grove on Saturday. 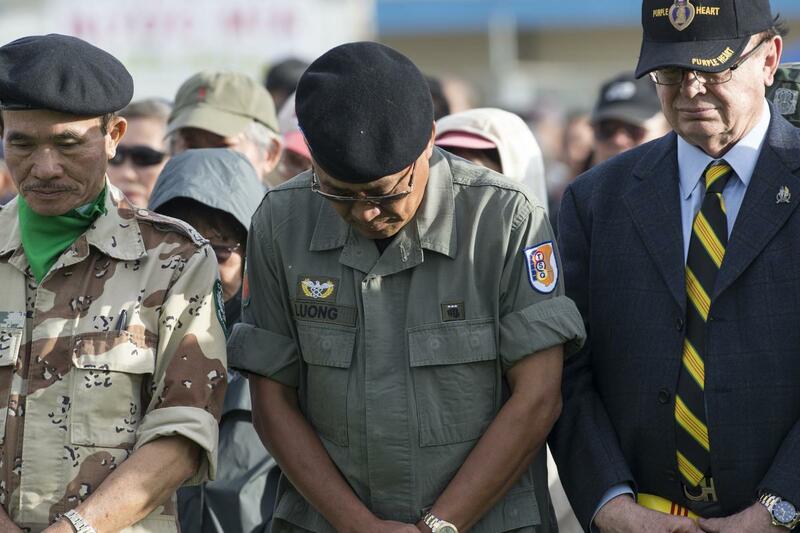 South Vietnamese Army lieutenant veteran Luong Phan, center, and retired Army lieutenant colonel Craig Mandeville, right, pause for a moment of prayer during The 40th Commemoration of Black April event at Bolsa Grande High School Stadium in Garden Grove on Saturday. The South Vietnamese puppet regime was nothing more than a bloated out puppetry of the US/EU Neo-Colonialists like the Soeharto regime a state controlled dictatorship that would eventually show it’s true colours after more than 30 years. I do not pity nor do i feel any remors. Long live the Socialist Republic of Vietnam and may the traitors of the south be hung by the neck as the dogs they are!